LOS ANGELES -- Los Angeles police are increasingly relying on technology that not only tells patrol officers where crime is most likely to occur but also identifies and keeps track of ex-cons and other bad guys they believe are most likely to commit them. Police say the effort has already helped reduce crime in one of the city's most notorious and historically gang-ridden neighborhoods. "This is a tremendous step forward. Without this, I couldn't do my job," said Capt. Ed Prokop, head of the Los Angeles Police Department division that watches over the grimly nicknamed "Shootin' Newton" area. The program - part data collection, part lightning-fast computer platform, part street-level intelligence-gathering - is expanding in LA with the help of a recent federal infusion of $400,000 and has drawn interest from departments across North America. Dubbed LASER for its ability to zero in on offenders and hotspots, it is one of many newer law enforcement tools that use data tracking and collection - such as license plate scanners and cellphone trackers - often with little public knowledge or regulation. Privacy advocates say LASER isn't transparent, has no clear oversight and unjustly focuses on keeping ex-convicts under suspicion even though they've served their time. "People who have paid their debts to society shouldn't remain stigmatized in the eyes of police," said Kade Crockford of the American Civil Liberties Union. LASER uses technology developed by the CIA's venture capital arm to realize a post-9/11 dream that allows investigators to match up vast troves of data from 15 separate sources to connect dots that they otherwise might miss. Funded by federal grants, it launched in 2011 in Newton, and an expansion funded by additional money in October, brought the program to a total of eight areas throughout the city, plus the department's high-tech analysis unit and its helicopters. 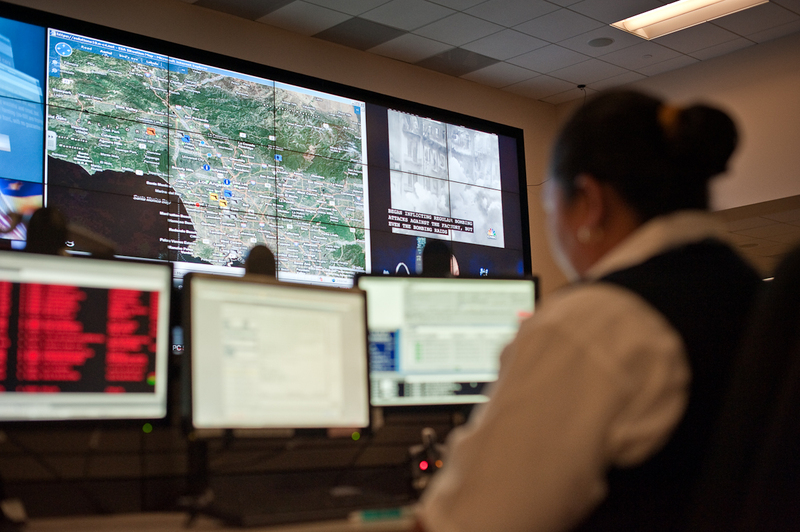 More than 3,500 LAPD officers have been trained to use Palantir, a platform that was introduced initially to speed up the process of creating dossiers on chronic offenders and is now used throughout the department for a variety of investigative purposes. Officials from New York, Nevada, Wisconsin, Washington, Texas and Canada have been briefed on LASER, said Craig Uchida, president of Justice & Security Strategies, Inc., and the program's research partner. There has been little outside scrutiny of LASER because the nearly $1 million used to fund it doesn't affect city budgets. Police officials, however, say it works and cite a steady drop in killings in Newton compared to other areas not using the program. There were 39 homicides a year before the program started and 14 last year, they say. And at the end of the first year, 87 of the 124 people the program identified as chronic offenders were arrested at least once for "like crimes," officials said. Privacy advocates say those statistics alone aren't enough to determine whether the program is effective. Under the program, police crunch historical data to determine where crimes have frequently occurred so officers can spend more time at those places. It also creates a list of people it considers more likely to commit crimes based on past behavior. A crime intelligence unit creates the lists by reviewing interview cards officers submit after stopping people on the street. The unit pays special attention to mentions of gun-related crimes or robberies, and people with violent and lengthy criminal histories. Police say the lists, which are marked information only and include a photo and the license plate numbers of vehicles that offenders use, among other information, often become starting points in a violent crime investigation. Supporters say LASER is different than the New York City police department's "stop and frisk" policy, an anti-street crime program that was deemed unconstitutional because officers disproportionately targeted minorities who hadn't broken the law. Crockford said the LAPD risks alienating minorities. "You're repackaging old biases in new technologies," she said. ACLU lawyer Peter Bibring said the bulletins amount to intelligence files on people who may commit crimes - a violation of federal law. Once on the list, he said, "the chances of police scrutiny go up significantly, and your chances of being identified wrongly in a crime." Bibring said it's also not clear that the program is following the department's own standards for collecting criminal intelligence. An LAPD division was shut down 30 years ago after the public learned it was compiling millions of intelligence files on 55,000 people. LASER analysts are encouraged to purge lists to remove those who haven't committed a crime in more than six months, but there is no requirement, Uchida said. David Carter, a former police officer and expert on criminal justice and police surveillance at Michigan State University, said he can understand the civil libertarians' concerns, but that the police are "doing their due diligence" and their actions are based on reasonable suspicion. Jim Bueermann, the president of the nonprofit Police Foundation, said it makes sense for police to focus limited resources on troubled areas and people, but they must tread carefully because "American policing has a history of abusing this notion of domestic intelligence gathering." There's a fine line, he said, between being smart on crime and saying that a criminal will always be a criminal. "People do change," he said.